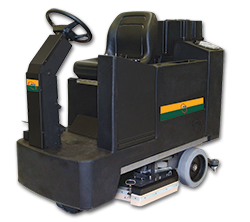 Automatic floor scrubbers, also known as auto scrubbers, are a type of floor cleaning machine that can be ridden on or walked behind. These machines have either a rotary disc or cylindrical scrubbing head and an automated system for dispensing cleaning solution and then vacuuming it up. In one pass over the floor, a user can dispense a cleaning solution, scrub the floor and then vacuum it all up with an auto scrubber squeegee attachment at the back of the machine. Auto scrubbers have a dispensing tank and a collection tank to keep your clean water from your dirty water. Occasionally, the solution system should be flushed with a water/vinegar mixture, to remove any soap and calcium deposits that could build in the solution system. Many organization choose auto scrubbers as an alternative to traditional cleaning methods such as a mop and bucket due to their cleaning time performance and efficiency. Get started with a WAXIE representative to find out how an auto scrubber can improve the performance and wellness of your work environment! Click here to view more autoscrubbers. 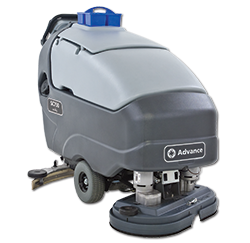 Advance’s rugged, low-maintenance SC750 scrubber delivers incredible value on a walk-behind platform. High productivity per tank full allows for 84 minutes of continuous scrubbing, which reduces dump/refill cycles and helps provide fast ROI. The optional EcoFlex™ System offers the flexibility to clean across the entire cleaning spectrum from green to clean. At the touch of a button one can switch from chemical free cleaning to using an ultra low dilution ratio, and of course detergent can be used at full strength for the toughest of soils. Item #570426 Click here to view more autoscrubbers. Just another small scrubber? Think again. 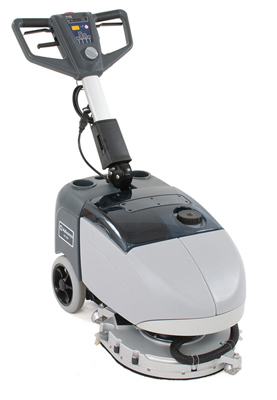 The Advance SC350 micro scrubber proves it’s in a class of it its own, delivering faster, better and easier scrubbing. Combine these features with the unique, fully-adjustable rotating deck and you are on your way to superior scrubbing performance. 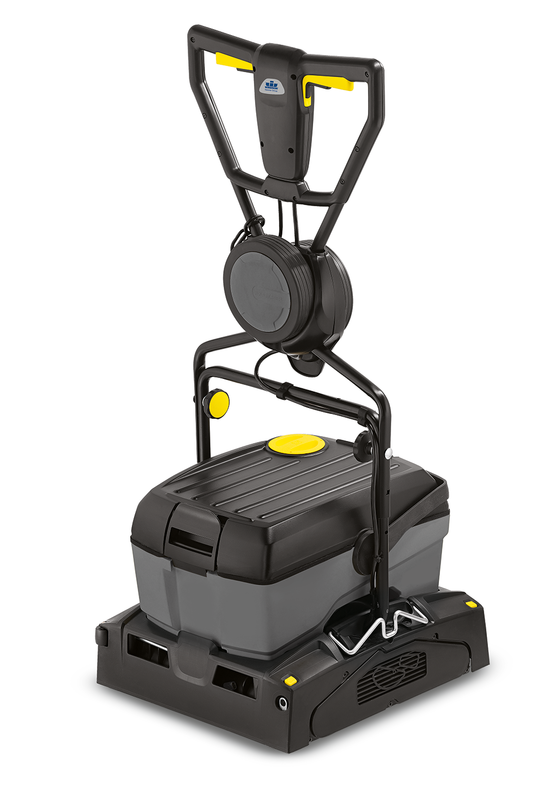 Featuring full batterypowered operation with a standard onboard battery charger, the 14 inch disc delivers more scrubbing with minimal downtime and less hassle. Plus, at only 64 dB A, the SC350 is the quietest machine in its class, making daytime cleaning and cleaning of noise-sensitive areas an easy option. 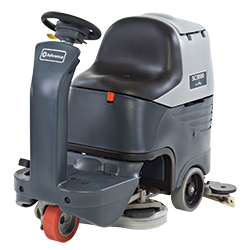 With its compact, maneuverable design, the SC350 is ideal for scrubbing in tight corners or under tables and chairs. 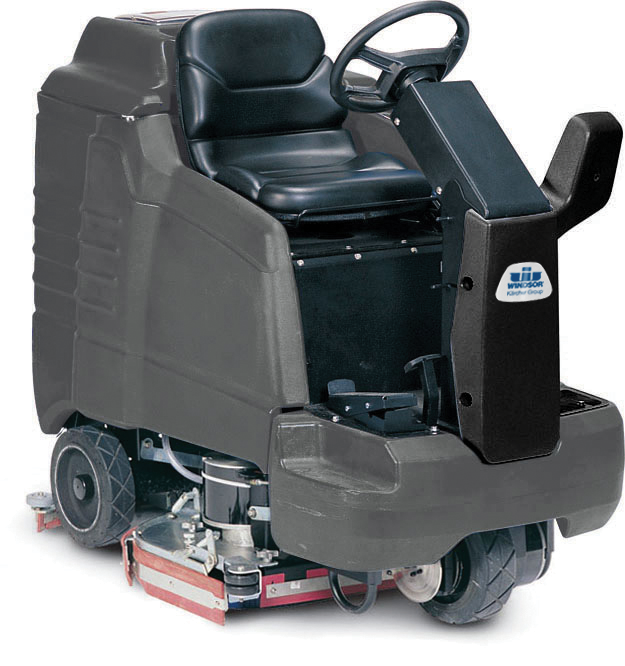 Easy to operate ride-on scrubber with 29" cleaning path has 29-gallon solution tank and 32-gallon recovery tank. The Champ 2929 is tough enough for big jobs, yet compact enough to fit through a 36" doorway. Turns completely around in a 67" space, has a rotocast polyethylene body and a curved squeegee with Linatex-rubber blades. 41,580 square feet per hour cleaning rate. Utilizes twin 15" short trim pad holders. Has a 2-HP brush drive motor and a 0.75-HP three-stage vacuum motor for total water pick-up. 36V power system offers increased run time. Item #570561 Click here to view more autoscrubbers. The EBG-20/C Surface Preparation Machine features a smooth 3450-PRM motor, 50’ 14-gauge power cord with lighted hospital grade plug, Dust Containment Kit, weighs in at 158-pounds and is versatile enough to provide total floor preparation solutions. The 6”x2” non-marking wheels and ball bearings are coupled with a ¾” axle for greater mobility. It includes removable weights. An optional two-piece handle and hour meter are available. Item #571052 View the flyer.